The information related to the Junagadh Agricultural University Recruitment 2018-2019. So, the applicants need to refer the whole page to get the clarification about the JAU Notification 2018-2019. Moreover, we have provided all the details like Age Limit, Educational Qualification, and Salary. In addition to this, we have arranged the Steps to Apply For The Junagadh Agricultural University Recruitment 2018-2019. Hence, applicants can get all the particulars regarding Junagadh Agricultural University Notification 2018-2019 by referring this page. The JAU is related the notification to fill the 101 vacancies for the different positions. Furthermore, the application process will be available only up to 14th April 2018. Hence, the interested applicants need to check the eligibility criteria. 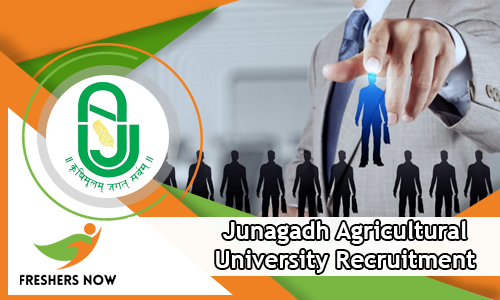 Candidates who are interested to work in the agricultural field can apply for the Junagadh Agricultural University Recruitment 2018-2019. Moreover, aspirants need once cross check all the details which are provided on this page before applying for the JAU Notification 2018-2019. Furthermore, we have gathered all the details form the official web portal. So, candidates can check the particulars without any doubt. In addition to this, more details are provided in the below sections. So, competitors can take a glance at the table to get the clarification about the Junagadh Agricultural University Notification 2018-2019. The Junagadh Agricultural University has released the Junagadh Agricultural University Recruitment 2018-2019 for the Professor, Assistant Professor, Dean, Principal, Registrar positions. Hence, the aspirants need to apply fastly. Moreover, the applications which are filled after the last date will be rejected. And, at the last dates, the number of competitors will apply. Therefore, the official link may be slow due to the rush of candidates, So, to avoid the rush aspirants need to apply quickly. From the above table, candidates can know the official website of the Junagadh Agricultural University. The aspirants who want to apply for the Junagadh Agricultural University Recruitment 2018-2019 need to below 45 and 55 years based on their applied post. So, the candidates need to check the age limit before starting the registration process. And, the interview is only the selection process for the aspirants who had applied for the JAU Notification 2018-2019. Hence, the competitors need to apply fastly for the Junagadh Agricultural University Notification 2018-2019. Moreover, aspirants need to waste their time for checking the syllabus and previous papers because there is no written test. And, the candidates who had applied for the Junagadh Agricultural University Recruitment 2018-2019 will pay the pay scale best in the market. Furthermore, more details related to the salary are provided in the below sections. So, applicants can check and follow our website regularly. And, while checking the educational qualifications aspirants need to be careful and based on their applied post they need to verify the details. In addition to this, applicants need to pay the fee while applying for the Junagadh Agricultural University Notification 2018-2019 based on their category. For the aspirants who had applied for the Junagadh Agricultural University Recruitment 2018-2019 need to face the only interview, So, the applicants need to prepare for the interview process and need to know the tips to crack the interview. The JAU officials have not yet announced the interview date. Moreover, we will update the information on this page after the announcement by the authorities. So, the aspirants need to stay with us to get the fresh updates. And, to apply for the Junagadh Agricultural University Recruitment 2018-2019 aspirants need to follow the given steps. Then it is easy for the candidates to apply for the JAU Notification 2018-2019 without facing any issues. Therefore, contenders need to simply follow the instructions given on this page. Moreover, we have provided the fee details in the below sections. So, aspirants need to refer all the below sections to get an overview of the Junagadh Agricultural University Notification 2018-2019. So, for more clarification follow our web portal Freshers Now. Hope, the given article on Junagadh Agricultural University Recruitment 2018-2019 is useful to all the applicants. Applicants having any queries can leave a comment in the below comment box.